Washington – The U.S. House of Representatives on Tuesday approved a bill that would block the sale of Plum Island — a strip of land in Long Island Sound — to the highest bidder. The voice vote on the bill was a substantial win for environmentalists, conservationists and Connecticut lawmakers who want to preserve the island as a natural habitat — but only if the Senate follows suit. Plum Island for decades has been the site of research into the world’s most deadly animal diseases, including swine flu and foot-and-mouth disease, a highly contagious livestock illness. But the operations of its Animal Disease Center are being moved to a larger, more secure site in Manhattan, Kansas, that will be called the National Bio and Agro-Defense Facility. The General Services Administration has been tasked with selling Plum Island off. In its online sales listing, the GSA says the 840-acre island “boasts sandy shoreline, beautiful views and a harbor strategically situated to provide easy access. It also says the island’s architectural highlights include a lighthouse built in 1869 and listed on the National Register of Historic Places, along with buildings and battery stations constructed as part of Fort Terry, a military fort actively used during the buildup to the Spanish-American War and during World Wars I and II. Local officials, a cadre of federal lawmakers and dozens of environmental groups have been trying to block the sale. The bill to do so was sponsored by Rep. Lee Zeldin, R-N.Y. It would require the Department of Homeland Security, which owns the island, to come up with a plan for its future that focuses on conservation. The plan also would require DHS to develop alternative uses for the island, including transferring it to a federal agency, state or local government or a nonprofit. Zeldin’s bill, cosponsored by Rep. Joe Courtney, D-2nd District, and Rosa DeLauro, D-3rd District, also would suspend laws approved in 2008 and 2011 that mandated the GSA sell Plum Island. The island, for national security reasons, has been off limits to the public for years. 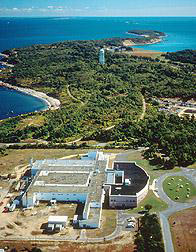 Only a small section of Plum Island was devoted to the biological lab and its support. That made the site a unique ecosystem, conservationists say. “They are not making many more coastal habitats like this,” said Patrick Comins, executive director of the Connecticut Audubon Society. Comins said the island is home to hundreds of species of birds and wildlife and a resting place for migrating flocks. “They rest, forage, and fatten up for the rest of their journey,” Comins said. The House of Representatives approved a similar bill about a year ago. But the Senate failed to pass legislation sponsored by the senators from New York and Connecticut that also would have blocked the Plum Island sale. “There’s a lot of support from stakeholders from both sides of the Sound that will help in that effort,” Coutney said. The four senators who sponsored the Plum Island legislation, including Richard Blumenthal and Chris Murphy, are all Democrats and the Senate is in GOP hands. But those senators include Charles Schumer, D-N.Y, who this year was elected Senate minority leader. “With open space ever dwindling on Long Island, we should do everything possible to preserve the environmental and wildlife habitat that is Plum Island,” Schumer said last year. “We should change current law and prevent Plum Island from being sold to a private developer.